Color is the pulsating blood of Sferical painting. The lively palette of Sferico in the very pure colors, matched by harmonic contrast, find maximum expression in the chromatic dynamic as anthropomorphic chemistry. The world is portrayed as an iceberg tip, the scenario of reality appears as if in a dream, where the volumes become thinner in an immaterial consistency. The real driving force is the angelic circle that revolves around the sun and enters the matter, creating a “magical” vortex. On the lower left, the fossil story narrates the end. On contrary, on the right, the paradise is depositary of the history in the sky, that from the first forms of life arrives to cloudy human conformations. 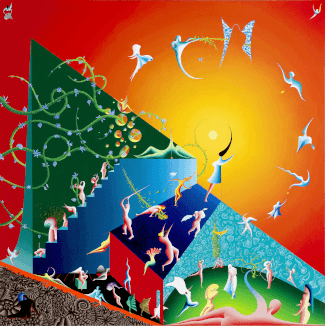 The central figure passes through color, space and light through a cut. The purity of the colors indicates that Adam and Eve are still in the Eden. 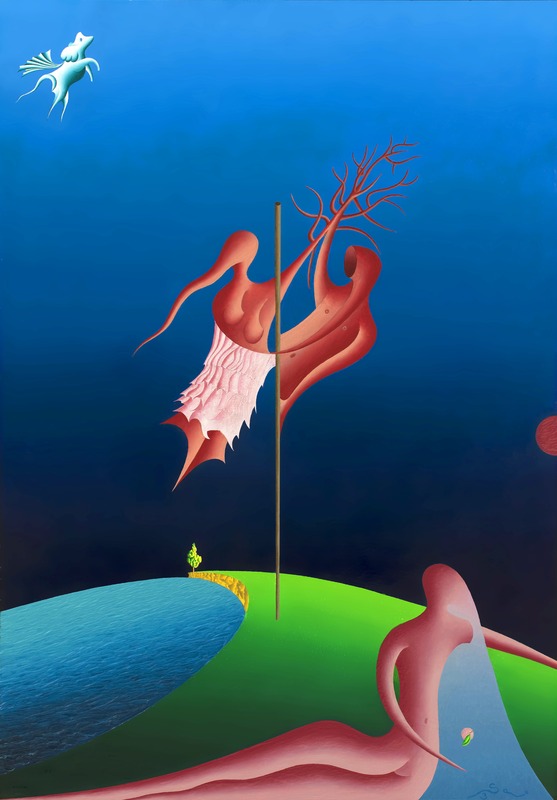 The concept of tree extends on two plains: at first the couple has suspended itself elevating with a perch, poised. Secondarily the tree that is generated by Eve will be the descendence. The pictorial will to leave the branches bare is to create a similarity with veins bathed with blood that stand out in the the depth now distant from the sky. At the bottom of the work, the wave that collides on Eva’s legs is the shock that the snake on the ground has crept. A flourishing tree can be glimpsed in the distance and, particularly incisive, it’s a celestial apparition at the top that resembles an elephant that flies like the paradoxical coexistence of a destiny that will affect every human being. Original. The canvas offers the palpable sensation of the dynamic force of pure colors. Born on an antecedent painting, always depicting three figures, it was developed in the depth of a work that doesn’t surrender to the conclusion of a work, but goes further, destroying the finished to dig in depth. 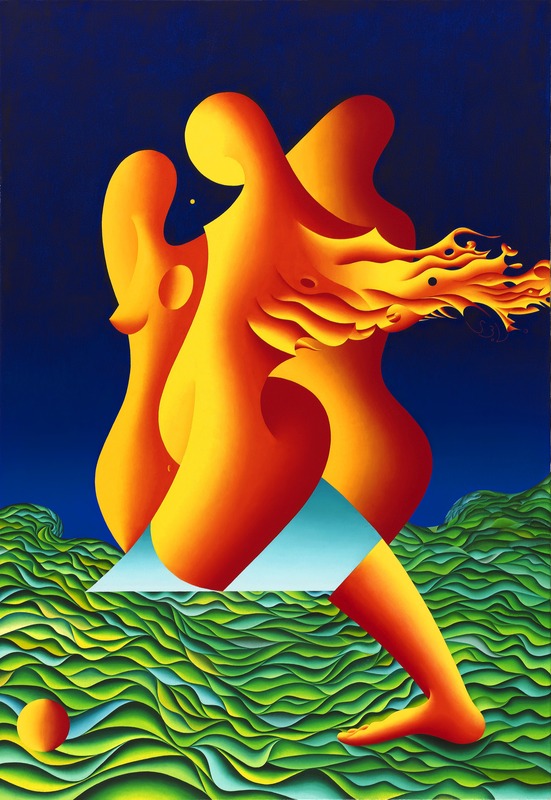 The painting is the three figures and the union generates the flames that are formed by the speed of movement. The passage of time is an uncontaminated land, portrayed by a vast sea of vegetal waves. Bodies made of pure spirit walk in a heavenly aerial substance and the leg that descends to the ground has a symbolic value.